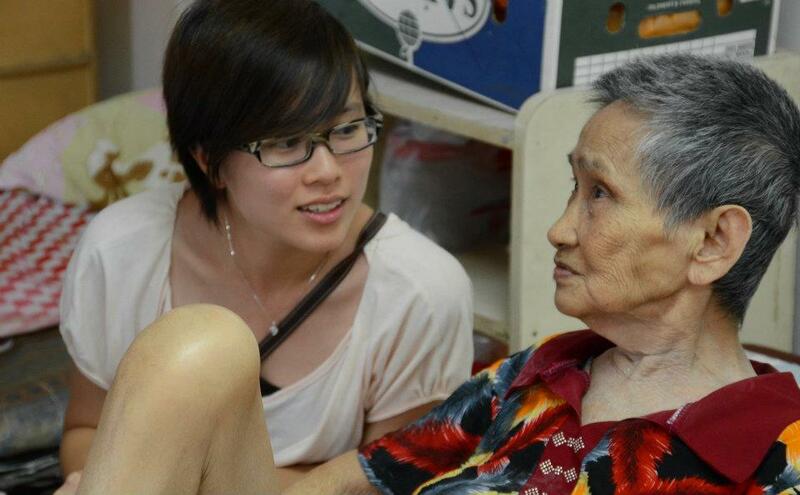 We came across Joey How’s personal blog post on her trip with us to the Tong Sim home for the elderly in Sungei Besi. Her article was warm, uplifting, compelling and from the heart. This is why we have asked her permission to post her article instead of our usual posting. May all be well and happy always! A kind deed a day. Determined to make AKDAD a reality, I recently signed up as a volunteer at several charity organisations. Why not put my knowledge and skills to help people help others? 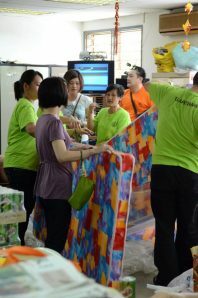 So when Ti-Ratana called and asked if I could help them blog, I was pleasantly surprised.We visited the TongSim Senior Citizens Care Centre last weekend. While it wasn’t my first time visiting an old folks’ home, this initiative has certainly opened up my eyes in many ways. 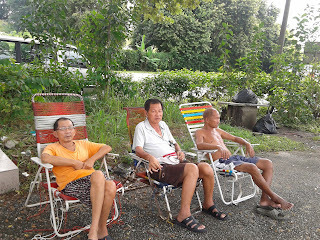 What started out as an intention to bring cheers and joy to the lonely residents there ended up helping me spiritually and enlightening my mind about the greatness of compassion, humility and generosity. 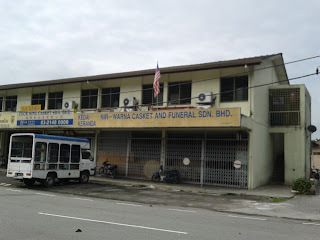 Having operated for the last 11 years at Sungai Besi within the grounds of Kwong Tong Cemetery, the Centre was established by chance. Back then, its noble and humble founder – Uncle Cheong Loy – who still runs a funeral parlour below the Centre today, was kind enough to share the vacant space above his shop and provided free accommodation to those from outstation who were seeking treatments in nearby hospitals. 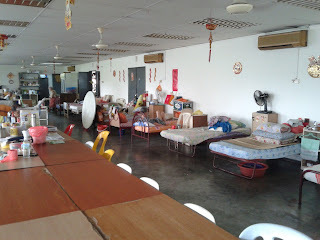 Soon, the place turned into a home for the elderly who were abandoned by their families and relatives, and had nowhere to go. 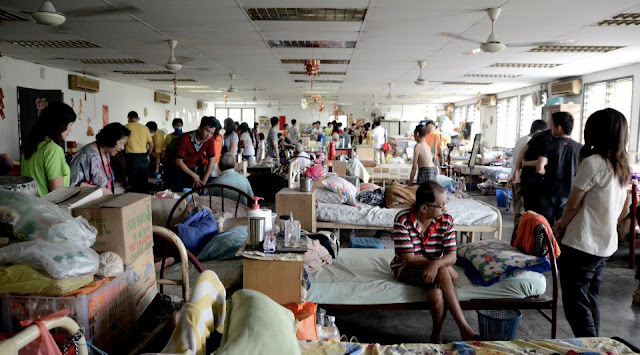 hospitals but daily maintenance and necessity expenses come from Uncle Cheong Loy’s pocket besides donations from the public. 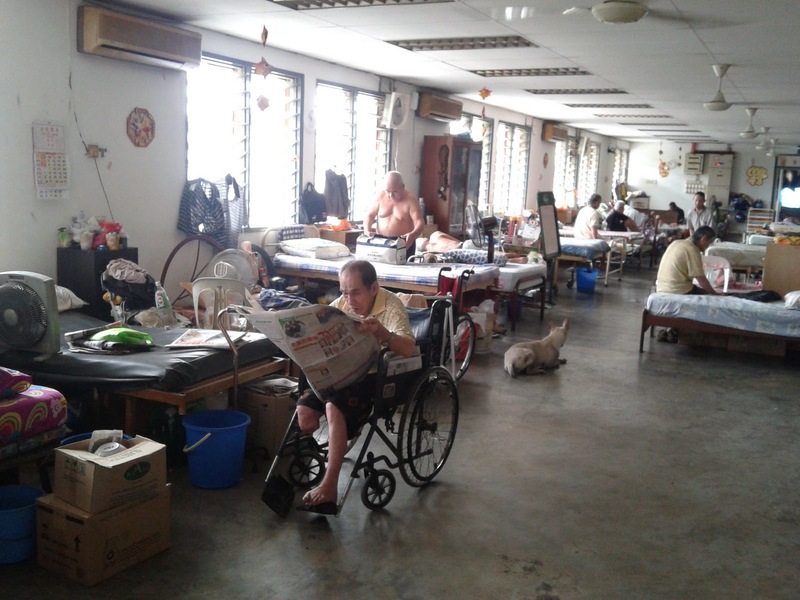 A majority of the residents here were admitted to the hospitals by their own children, family or relatives who then went missing or became unreachable when these elderly were well enough to be discharged. Only one or two elderly at the Centre live there by choice. Uncle Cheong Loy shared that one of the female inmates was often abused by her husband and was admitted to Tong Sim by her daughter. She has since found peace there and gets visits from her daughter once in a while. A place they called ‘home’To be awfully honestly, I was rather reluctant to go at first. I didn’t know what to expect and what to say to the elderly folks there. Plus I’m not good with seeing people live in appalling conditions – more often than not, I would freeze and break down in emotions. But a promise is a promise. Hubby was more than happy to go with me. The volunteers were a cheerful and humble lot comprising mainly young adults. 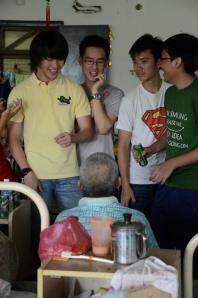 When many of their peers were out in the malls loitering around, these youth dedicated their time to cheering up the old people at Tong Sim. It’s probably dubbed an “uncool” thing to do but nonetheless, I’m touched with their big hearts. As we walked in, there was a unberable smell of urine stench. 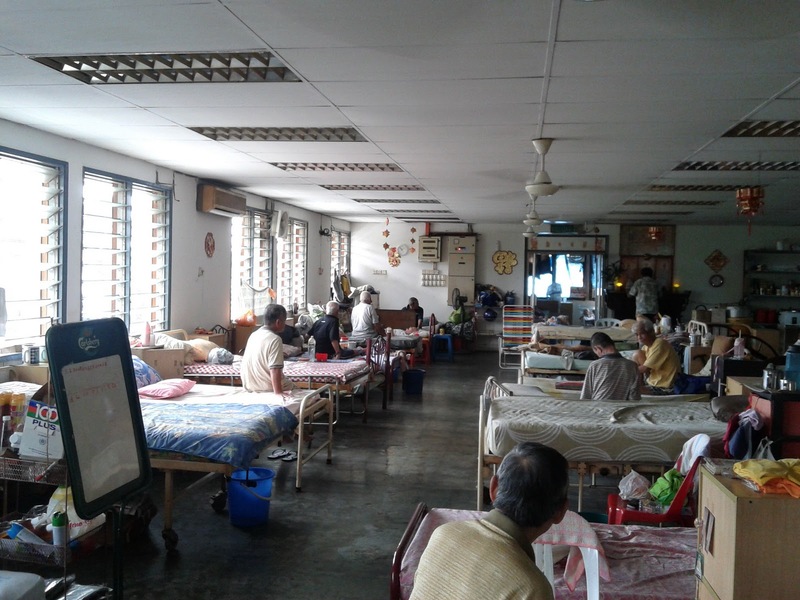 Some of the elderly were seen resting, some just sitting up and staring into the blank walls. The living condition was nowhere near comfortable but to the residents, they are probably grateful for a roof above their heads. 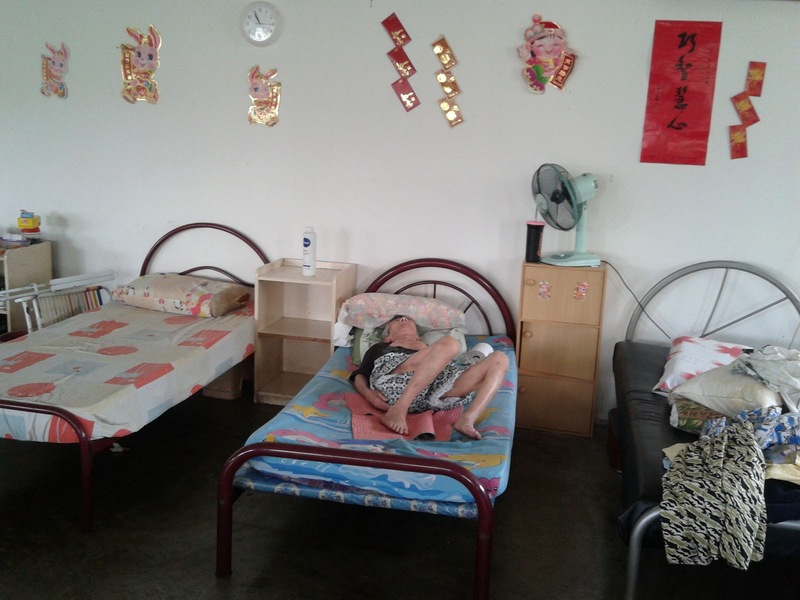 Over 40 beds were placed closely next to each other across the hall, the fans were blasting to keep the heat at bay, and residents of both genders live, eat and change on the same floor. 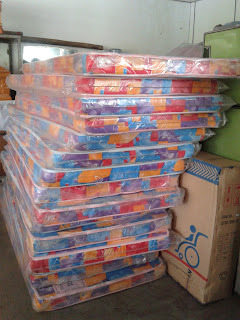 The immobile ones are given a pail each, placed next to their beds, to contain any bodily discharge – hence the stench. There were neither curtains to shield them from the strong sun nor separators for individual privacy. Whether you are healthy, handicapped or bedridden, everyone shares the same air and space. 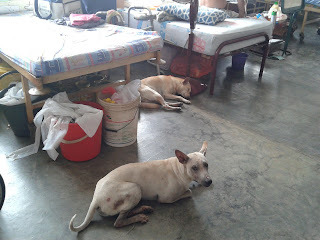 I cannot imagine my parents, in-laws or even myself living in such deplorable condition. Most of us felt a little awkward at first but as one by one approached the elderly, the group loosened up and sat down to chat with them. Some seemed happy with our presence, while the rest continued to rest or preferred to keep to themselves. I wouldn’t blame them for such behaviour as they may have lost trust for human kind after being abandoned by people whom they trusted most. One particular Uncle who looked fit and considerably younger than the rest started whipping out his collection of books to share with the youths. He certainly looked like he didn’t belong there (who does?!). 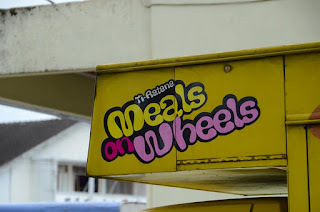 Hubby had a long chat with an Indian man who complained that the lunch provided was too ‘soft’ to his liking and that we should serve some meat as well. According to him, he has never been married and was previously a government worker but was fired after missing work often due to his illness. 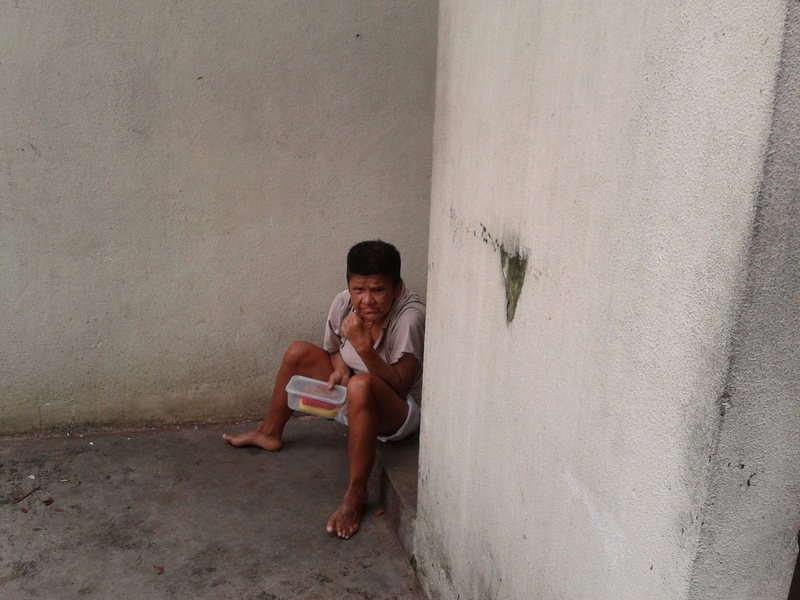 He has a family in Cheras but chose to live in the Centre for not wanting to burden his aging siblings. I won’t forget an Uncle who wore a smile throughout our visit there. Despite being speech impaired, he took on the role of caring for his bedridden neighbour. Seeing that we were serving lunch, he waddled towards the kitchen in small and slow steps to grab a bowl before passing it to me. He signed ‘food’ and pointed towards his friend, asking me to fetch some lunch for him as well. His friend may be immobile, but he sure is fortunate to have a caring pal like this Uncle. The bedridden Uncle definitely had a great appetite because he finished one whole orange that I peeled for him. Another Uncle kept grinning and asking for some pocket money. Although we didn’t understand what he was trying to say after Hubby passed him a small token of angpow, he sure looked very grateful. 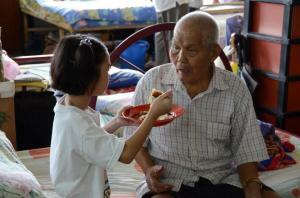 At another end of the hall, a little girl around six years old was seen feeding one of the elderly who seemed to be basking in the attention. Another man selflessly carried a handicapped aunty from a chair to her bed – there were no qualms, no expectations, just loving kindness. These moments inspired me to raise my boy to be like that one day. he open-mindedly helped out with capturing beautiful memories from the visit. I admire his focus in making a difference to his community, regardless of race, religion and gender. Soon all the volunteers gathered at the front of the hall and belted out a series of festive numbers, oldies and popular Mandarin songs. Some of the elderly joined in and sang along while some stared and clapped away. My heart broke when an Uncle who came to the Centre six months ago, was seen shedding tears and losing composure upon hearing the familiar melodies. He must have missed his family terribly. Up until now, I couldn’t forget the heart-wrenching expression painted on his face. By the end of the visit, my mind forgot about the discomfort and my nose got accustomed to the stench. Before we left, I said goodbye to one of the old men who was confined to his bed as well. I told him to take care and he replied in Cantonese, “Can’t hear you”. I replied in Mandarin, “I don’t know how to speak Cantonese, Uncle but take care”. He gave me the biggest, toothless smile ever. 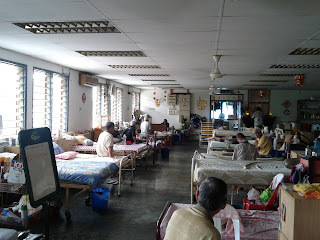 It was my first-time getting really up close and personal with these abandoned elderly but I’m glad to be there to show them that there are still people who care about them. As we drove home that afternoon, I couldn’t stop pondering, “What has gone so badly or seemed so impossible that their children and relatives resorted to leaving them behind?” I’m still seeking for an answer. As for your concluding para, I think about it every time I see a homeless person in the streets. “What has he done in his past, that he doesn’t have a family and a home to go back to now?” And the more I think of the question, the more I believe in karma. 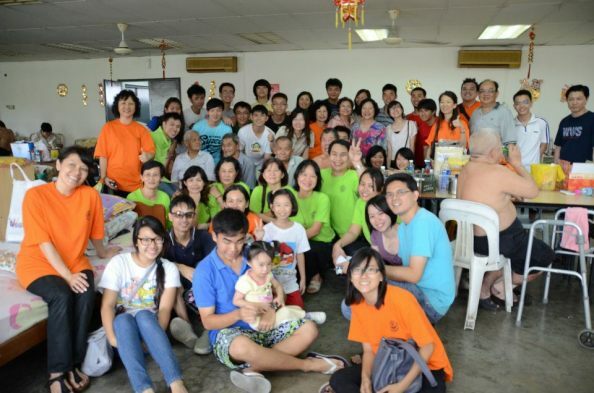 MOW CELEBRATE - UPDATE to 8 January, Sunday 2012 Ti-Ratana Penchala’s Meals on Wheels will be wheeling to Tong Sim Senior Citizen’s Care Centre in Sungei Besi, Kuala Lumpur bringing Chinese New Year cheers. 6 Jan 2012 today and a big Hello to all, Meals on Wheels are ready to wheel with excitement and loads of love this 8 Jan 2011 Sunday to bring share and care to the elderly citizens at Tong Sim. Brother Ivan and Bro Tommy have make extra effort to deliver earlier so visitors can rejoice with the inmates on their new mattresses and bedsheets. We have a team who is going to whip up surprise performances to bring everyone some light hearted moments. **We have update the wish list and if any names are left out please email us immediately. Any of such mistakes is for sure an oversight. Any volunters who wish to join us to please email us your names for logistic reasons and please arrange your own transportation. Scroll down to check 'volunteers important notice' below for more info. 6) Miss Chong donate cookies and mandarin oranges.